In celebration of Blizzard's newest animated short, learn more about the fan-favorite MEKA pilot. Hi Sony players! I’m Michael Chu, the lead writer for Overwatch! In honor of the release of our new Overwatch animated short, “Shooting Star,” which centers around D.Va, I’m answering a few frequent questions about our favorite mech pilot! Why do you think D.Va is on top of a lot of fan popularity polls? Lots of reasons! D.Va’s a gamer like all of us. She has a great visual design (including her mech) and fun gameplay. Her strength, attitude, and personality make her an appealing character who also occupies an interesting part of the Overwatch universe that we’re excited to continue to explore. How did she go from playing professional esports to piloting a mech on the battlefield? Since the end of the Omnic Crisis, the Mobile Exo-Force of the Korean Army (MEKA) has defended Korea against attacks by a massive omnic colossus (known as the “gwishin”) that rises from the sea from time to time. Originally, they utilized drone mechs, but MEKA were forced to turn to human pilots once the gwishin evolved to disrupt their networked control systems. MEKA turned to one of Korea’s greatest resources: the pro gamers (in addition to standouts from other fields with similar talents) who had the necessary reflexes and skills to operate the mechs. And that’s where Hana Song came into the picture. Will she ever join Overwatch? Is she the new generation of Heroes that Winston and Tracer talk about? Time will tell if D.Va joins up with Overwatch, but she is definitely part of the new generation of heroes, alongside others like Lúcio, Brigitte, and Mei. How did you come up with D.Va’s character design? We knew we wanted to make a hero that piloted a mech. We went through a lot of iteration on how exactly the gameplay between the pilot and the mech played out, but it was always a constant we wanted to have both. Eventually we settled on a pilot that would fight inside the mech, and then eject and fight on the battlefield as an unprotected pilot. Our Assistant Art Director, Arnold Tsang, took inspiration from mech anime and manga for her visual look. One thing I’m often asked is where the bunny motif came from. Originally, D.Va had more of a cat theme, but after we gave her the Boosters ability (which enables her to fly around) we thought about theming the whole package as a bunny hop. Here’s a burning question from fans around the world: Where do all the extra mechs come from?! The MEKA base in Busan. Dae-hyun (D.Va’s mechanic) and Myung (her commanding officer) would really like everyone to take it easy on those Self-Destructs though. The budgets get scary quickly! Who is Hana Song? What is her connection to the heroes of Overwatch? Hana Song is a world champion esports star who was recruited by MEKA to be one of their new squad of pilots. Her immense talent, fast reflexes, and natural skills made her an ideal candidate. Growing up in the shadow of the gwishin, she felt the responsibility to serve and protect her homeland. She wanted to do her part to defend her country, but also to test her abilities in a new arena. (Not to mention proving that she was the best of her other extremely talented squadmates.) Having conquered the landscape of esports, D.Va is looking to prove herself where the stakes are immeasurably higher. While the five main pilots of MEKA are all standouts in their own right, Hana is unquestionably the star. Does she care about Overwatch and its mission or is it more about national pride for her? Korea is actually more pro-Overwatch than most countries, in part because the threat of omnic war is ever present to them (and they never suffered a big falling out with Overwatch like Russia). But at the moment, D.Va is more focused on protecting her country than the situation for the whole world. How impactful was creating the Busan map and was D.Va’s kit a focal point in its design? The team was extremely excited to do a map in Korea, as Blizzard and Korea have always had a special relationship. In creating the Busan map, we had a number of goals: we wanted to show an Overwatch vision of future Korea (complete with karaoke, video games, and PC bangs), we wanted to show the home of D.Va and of MEKA, and we wanted it all to feel authentic and appropriate. We even went as far as to record audio from Busan for some of the sound effects in the level. Does she have ties to any of the other characters in the game? Though she sometimes seems like a solitary character, she’s supported by a lot of people around her. D.Va inherited her love for gaming from her father (who had been a professional gamer when he was younger). Of the MEKA personnel, she has known her mechanic, Dae-hyun (who appears in “Shooting Star”), the longest—they’ve been close friends since childhood. D.Va also has close ties to the rest of her squad, who include her former main esports rival Kyung-soo (“King”) and one of her former clanmates, tough and protective Yuna (“D.mon”). The other two members are the squad’s maknae, Seung-hwa (“Overlord”) and the flashy Jae-Eun (“Casino”, a former racing driver). Finally, there’s their commanding officer, Captain Myung (who you hear over the comms in the MEKA base part of the Busan map). What’s next for D.Va within the story of Overwatch? For now, D.Va is working to rebuild and continue to protect Korea against the gwishin omnics. They’re still very much learning how to perform at a high level as a team, and D.Va’s at the center of that effort. 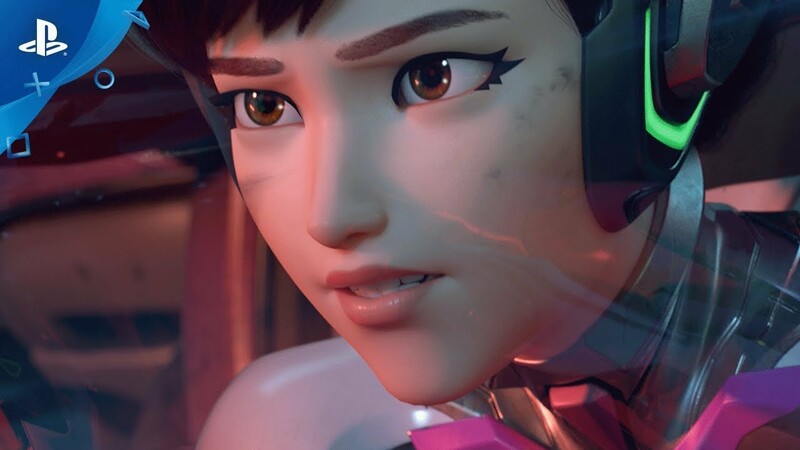 D.Va takes her role on the team extremely seriously, trying to help the team effectively carry out their missions and utilize everyone’s strengths to the fullest. What inspired the new Nano Cola skin? What’s the story around its creation? 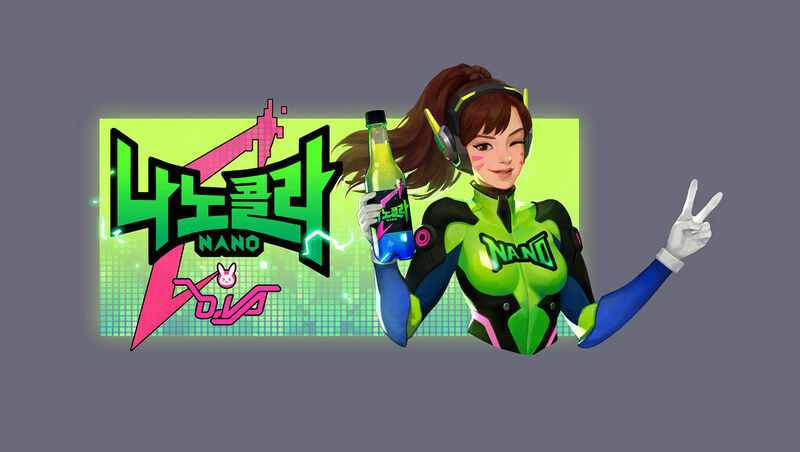 Back when we were getting ready to release Overwatch, we made an ad that featured D.Va as a spokesperson for “Nano Cola.” When we were looking at something in “Shooting Star” to highlight her status in the country, we decided to bring it to life. To celebrate the new animated short, we’re kicking off D.Va’s Nano Cola Challenge running from today until September 10, where you can unlock the Nano D.Va skin and other D.Va-themed rewards. The title should’ve been “D.Va D.Constructed”. Such a missed opportunity, but cool blog though.